We’re not a retail shop – we’re a full-service automotive care centre. We won’t try to sell you anything you don’t need. Our technicians only recommend maintenance and repairs to keep your car young – you decide if you want to go ahead. We’ve been your local trusted auto repair shop in South Calgary for over 22 years and our technicians have the same years of experience. We pride ourselves in our exceptional service guarantee and you as the customer are in control of your vehicles repair. We want what is best for you and your car and will do what it takes to keep you and your family safe on the roads as you travel. The BBB supports our claim of service and quality and we are proud to be associated with them. 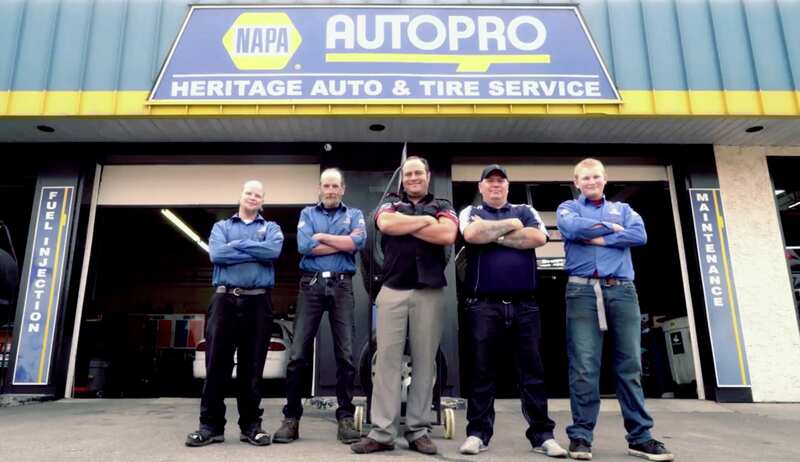 The NAPA AUTOPRO Get 12 months/20,000 km of worry-free protection on qualifying parts & labour performed by HERITAGE AUTOPRO and is honored at over 16,000 NAPA AUTOPRO and NAPA AutoCare locations across North America. We know its hard to believe that a mechanic shop can make such a claim, but we can. Even though we like big tires, we leave the smallest tracks possible on the planet when working on your vehicle. Scroll down and learn how that is true if you’re curious as to what we do. Whether your car needs a simple oil change or you need more work done like brakes or suspension work, we can help. With over 20 years experience, we’ve been on the block for a long time. So give us a call or request an appointment online today. With over experience that extends from North America, Japan and the UK and spans well over 22 years, there isn’t a mechanical team more equipped to handle any vehicle you have. We heat our shop with a Saturn heater that burns used oil based fluids vs disposing them as waste k- so if you have any used oil want to get rid of, we will take it. It helps keep us warm in the winter.